So, what is all the ‘Bulawoo’ at Anse Chastanet? New to the Treehouse Restaurant is our latest menu option ‘Bulawoo’ which translated from Creole means ‘small fish’. It’s a bit of a habit for Anse Chastanet to do things a little different and Bulawoo allows Chef Juan to highlight something we do very well, which is working closely with local fishermen which ensures all our seafood is acquired responsibly, with minimum negative impact on the oceans, ecosystems, and on the communities that depend upon them. All exactly in the same way as we operate our organic farm, not only growing produce in the most sustainable way, but sharing our knowledge with our farming neighbours. Back to the important stuff, the food. So from the Caribbean seafood bar the fresh options to choose from include: Snapper Tiradito, *Lionfish Ceviche and Wahoo Sashimi. Other menu items include the whole fish of the day roasted in banana leaf. During lobster season, guests can also enjoy Grilled Local Spiny Lobster with Passion Fruit Butter or the World’s Largest Shrimp. 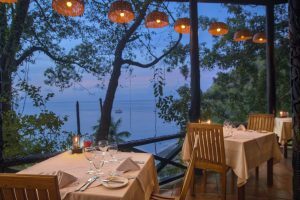 For those not in the know, the Anse Chastanet Treehouse is a two-level open-air restaurant and from its vantage point high in the forest canopy, diners feast on views of shimmering moon trails over the sea and a low rasping of treefrogs as a soundtrack. Whilst inside this romantic candlelit ambiance, guests are surrounded by beautiful original artwork. *Lionfish of course are invaders from the Pacific brought by the irresponsible and now a major threat to the reefs and marine life of the Caribbean. Hence why its on the menu. Like other concerned dive operations Scuba St Lucia are trying to fish the Lionfish to extinction and Anse Chastanet diners are doing their bit by eating them. And the real bonus? They’re very tasty…..